Why study with the Craniosacral Therapy Educational Trust? Does the course provide solid foundations to practice Craniosacral Therapy in a professional capacity? We think it's important to consider the content and length of the training. Whilst it may be tempting to go for a shorter training, would this provide you with the necessary skills and confidence to work in a professional capacity? Our experience is that each of the 48 days of classroom attendance over the two years of our training is required to develop important clinical skills. In earlier days we tried teaching shorter courses, but found that they were not enough! Does the curriculum cover a broad range of skills? We offer a well-structured curriculum that is rooted in the pioneering insights of the osteopathic founders of this work, whilst constantly evolving to include new perspectives and scientific research. Students are taught to work with a range of subtle rhythms that are expressed throughout the body, as well as the stillness that underlies these rhythms. We teach specific treatment skills for working with all areas of the body and the training includes important skills to work with states of emotional or physical trauma and overwhelm, as well as skills to work with babies and children. The result is that our courses provide a wide range of competencies to become effective and safe Craniosacral Therapists. What principles underpin the training? Our 'biodynamic' approach involves working with the natural forces that organize our form and function. We work with the principle that within each of us there is an unerring intelligence that is constantly seeking health and optimal balance – something that starts during our embryological development and continues throughout life. The role of the practitioner is to support this natural tendency, so that treatment can be effectively applied according to the needs of each patient. Within this approach the interconnections of body, mind and spirit are deeply acknowledged. We aim to provide a safe and supportive environment in which students can learn and develop. Do the teaching methods cater for different learning styles? Our teaching methods include lots of hands-on practical work, at all times supported by about one teacher for every four students. This allows for plenty of personal supervision and feedback. Furthermore, we use powerpoint presentations, lots of teaching aids (such as anatomical models), experiential exercises, movement practices, mindfulness and perceptual meditations, small group explorations, films and comprehensive class notes to support the learning process. We also hold a clear intention for our courses to be creative, open and enjoyable. Who teaches the course and do they have good experience? We are blessed with a fantastic faculty, including several leading teachers in the field. Our teachers have been in clinical practice, studying and running courses for many years, so they embody direct experience of the subjects taught. There is a team of teachers who are present throughout each training, as well as guest tutors who attend certain seminars. This means that students have the opportunity to learn directly from a number of experienced mentors. What qualifications does the training provide? In the UK there are two main practitioner registers of Craniosacral Therapists: the Craniosacral Therapy Association (CSTA) and the Complementary and Natural Healthcare Council (CNHC). Our school is fully accredited by both of these organisations, which allows graduates to be automatically accepted onto these registers. Furthermore, our professional qualification in Craniosacral Therapy is recognised by practitioner associations in numerous countries around the world. What kind of clinical training is provided? Craniosacral Therapy is primarily learned 'hands-on'. Our unique low cost Teaching Clinic enables students to gain relevant hands-on experience working with patients. 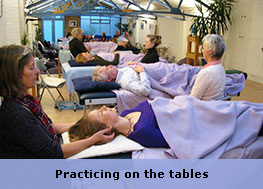 This involves one-to-one supervision by experienced practitioners, as well as opportunities to take a leading role in giving treatments during the latter stages of the training, so that by the time the course is over students can develop the necessary skills to work as 'front-line' therapists and the confidence to set up their own practices. What kind of practitioner development is included? To be successful you not only need to be a competent Craniosacral Therapist, but also have a range of personal abilities including communication skills, motivation, presence, understanding of your own boundaries, etc., as well as business and practice management skills. We ensure that these topics are built into our courses. The training is open to all, subject to an application process and interview. For those people who have little or no prior experience of anatomy and physiology, we offer an experiential, interactive and accredited "Living Anatomy" course designed to facilitate your own body awareness and understanding. 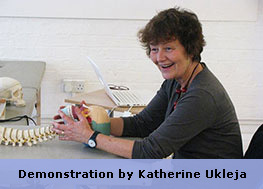 This course meets all the anatomy and physiology requirements for registration as a Craniosacral Therapist in the UK, as well as many other countries. How are the training facilities? Our light and spacious training venue in London provides superb facilities in pleasant surroundings with excellent transport links by road, rail or air. Our venue is well equipped with learning aids and audio-visual facilities. We're located in a quiet road just a few minutes' walk from Highbury and Islington station (Victoria line and Mainline). The area is also well served with shops, cafes and restaurants. The fees at CTET are very competitive. When comparing costs of courses you should look at the daily teaching rate and the overall cost including all extras to get a true comparison. It's also worth noting that we are registered as a training provider for Career Development Loans and we offer flexible payment options. What kind of continuing professional development opportunities are provided for graduates? The field of Craniosacral Therapy offers a lifetime of exploration and learning. We provide a wide range of continuing professional development seminars taught by leading international teachers and authors, so that graduates can keep developing and honing their skills. Our graduates also have the opportunity to study for an "Advanced Biodynamic Diploma (ABD)". How can prospective students find out more? We provide regular taster introductory weekends and talks so that you can visit our school, meet tutors and experience our teaching methods before deciding whether to apply for the practitioner training. You are also welcome to arrange to speak to the Course Director, Tracy Evans, if you have any questions about what's involved. To make an appointment, just call Esther Bradley on 020-7101 3915 or email info@cranio.co.uk. We have been established since 1989 and have extensive experience of providing Craniosacral Therapy trainings. Our class sizes are neither too large to lose a sense of personal attention, or too small to be able to experience working with a range of colleagues. We've found that running our seminars at approximately two-monthly intervals is ideal to help students practice and integrate the skills before learning new subjects. This two-year format also provides minimal disruption to everyday working life. Our training is open to people attending the first seminar, if spaces are available, before deciding whether to continue. After this, we find that it's a far deeper learning experience to have consistency and continuity within a training group. This promotes stability and safety, an ongoing group learning process, and allows for greater progression in the development of skills. This kind of continuity simply does not occur in modular trainings where people come and go throughout the course. Each student is designated with personal tutors throughout the training and ample support is offered between training seminars if any difficulties or questions arise. Many of our graduates have developed highly successful practices and are getting great results doing a job that they love. 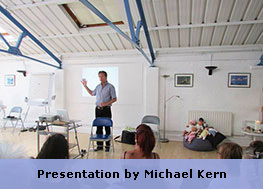 Our students also include many who have gone on to teach Craniosacral Therapy courses around the world. The book "Wisdom In The Body" by our course director, Michael Kern, is used as a core text for many Craniosacral Therapy trainings around the world and has been translated into ten languages. We have an on-site library and a shop where students can purchase course books at reduced prices. We have an excellent reputation .... so try and take time to talk to our students and graduates to see what they think of us.